Still, even when watercress is at its prime, I have a hard time dealing with it raw – it’s flavour is bitter, slightly peppery, which I often find overpowering when served in a salad or as a garnish. So I’ve been exploring watercress’s other uses, treating it more as an herb, and in the process have discovered some great ways to use this pungent green outside of the salad bowl. The sweet peas and refreshing mint in this recipe balance the peppery watercress, and it’s super delicious garnished with croutons, toasted seeds, or a hard boiled egg (or all of the above!). 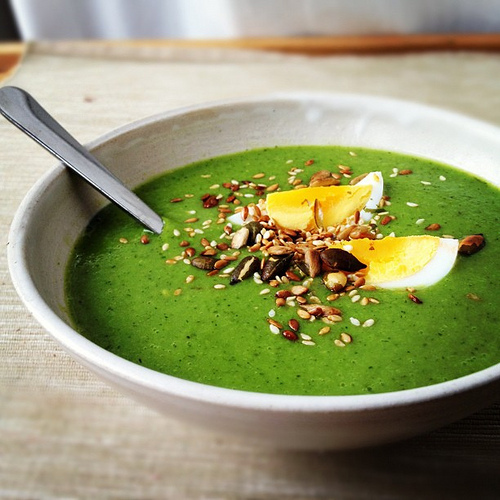 This soup requires a blender – I use a Froothie power blender which blitzes even the toughest of pea membranes and watercress stems into a fine puree. If you are working with a stick blender or something less powerful, you can strain out any stray solids after blend it to get a silky smooth and luxurious soup. Enjoy! 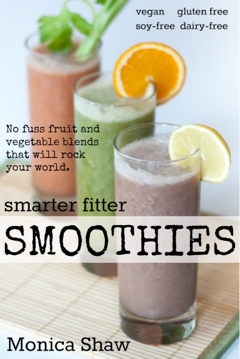 Just a heads up: this post contains affiliate links to the Froothie website – I’m a ambassador for their brand because, well, their blenders rule! Hard boiled egg in a soup might be my favorite new garnish–seriously can’t wait to try that goodness. And minted pea? Mmm yes please! I have a feeling this will happen next spring when fresh peas are available! Have added a link to this from this month’s Salad Days if that’s OK? Thanks, VP – and happy for you to include it in Salad Days, of course! That sounds like one gorgeous summer soup. The vibrant green is just sooooo appealing.